Mount Sniktau is the massive peak that catches skiers' eyes when they are driving west on Interstate 70 at mile marker 224 near the town of Silver Plume. The mountain is viewed by many, climbed by many, but skied from the summit to I-70 by few. Sniktau is a highly accessible mountain as it is connected directly to the popular Loveland Pass. The climb from Loveland Pass to the summit of Mount Sniktau is a good beginner mountaineering climb. The challenge of skiing on Sniktau is not the ascent, the challenge is the descent. Sniktau is frequently climbed from Loveland Pass and skiers need to re-climb the mountain or bushwhack through dense forest to a car shuttle. Mount Sniktau hosts the Loveland Valley ski area on its west flanks, and just above this was the location of the unfortunate avalanche accident in Sheep Creek that claimed the lives of five backcountry skiers and snowboarders in 2013. Front Range Ski Mountaineering advocates climbing the ski route before descending it. However, there are routes on the Front Range that locals commonly approach from another direction. The three routes described on Mount Sniktau are approached from Loveland Pass. A ski descent of Sniktau’s South Face will require a climb back up to the approach. A ski descent of the Northeast Face or Northwest Bowl will require a bushwhack exit to the Bakersville-Loveland Trail (a road) and then to the Bakersville or Herman Gulch Trailheads. Most skiers leave a car at the Herman Gulch Trailhead. 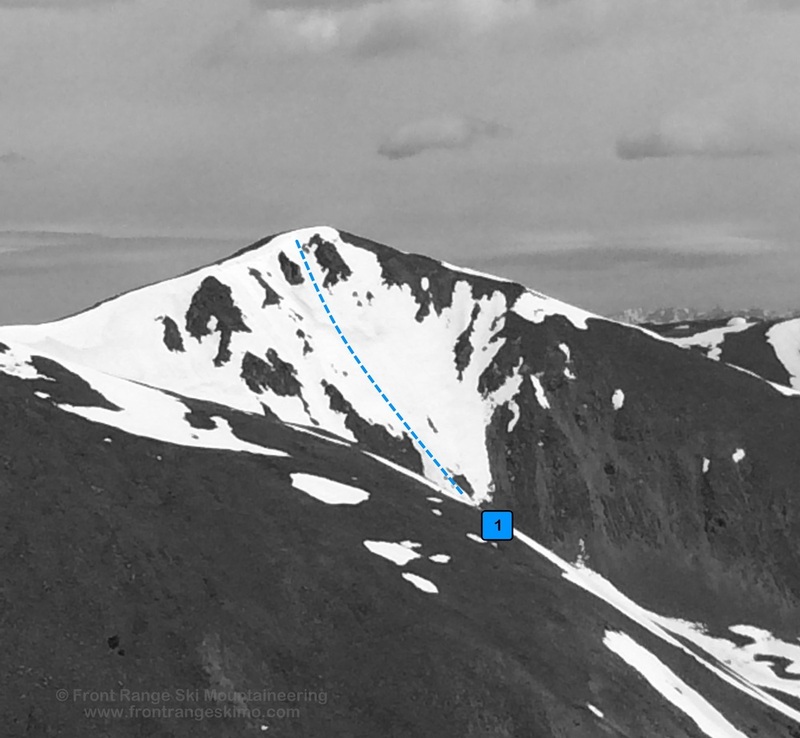 From the Continental Divide at Loveland Pass, climb east up the ridge line 1.7 miles to the summit of Mount Sniktau. There will be two false summits on the approach before reaching Mount Sniktau. The wind will pummel you up here. 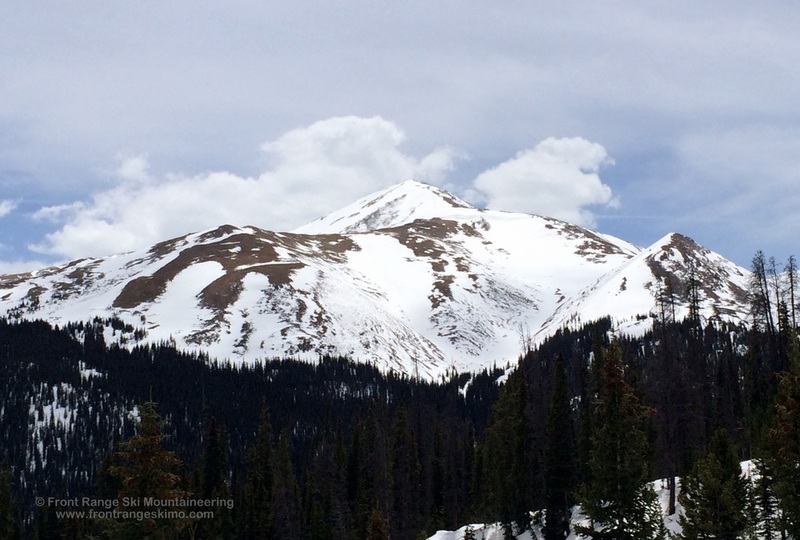 The first eight tenths of a mile will take you to a small peak (Point 12,915’) on the ridgeline that connects to Cupid and Grizzly to the south. Head north and slightly down hill and climb a half mile to a south peak of Sniktau (Point 13,152’). Be careful of cornices in to the right as you descend and then make the final ascent to the summit. There is an expansive view of the Clear Creek Valley, the surrounding peaks, and to numerous 14ers. This fine line is a sustained straight descent from the summit of Sniktau south and southeast to a bowl in a small glacial tarn. There are multiple lines to take to enter this face, and the skier’s left entrances are lined with cornices. There are opportunities to ski more vertical beyond the tarn into Kearney Creek drainage, and it is possible to ski out to the BLT road and then to the Bakersville Trailhead. Most skiers climb out of this basin back to the Continental Divide and ridge above Loveland Pass. From the ridge there are several options to ski down to the Loveland Pass area including the ascent ridge to the car, Overlook (D5) and Shockley’s (D4 – D5) from Point 12,195’ to the hair pin curve and hitchhike to the car, or climb to Cupid and ski Dave’s Wave to the curve above A-Basin ski area and hitchhike to the car. The broad Northeast Face of Mount Sniktau is the attractive face that catches the eye of ski mountaineers driving west on Interstate 70. The summit of Sniktau is nearly 3,000’ above I-70! There are various lines on this face, but the center can be quickly melted to rock in the spring. There are some cornice entrances to the skier’s left and right, but the right side cornices are manageable. The forest below the open bowl is comprised of dense and dark timber. An alternative to skiing down this forest is to descend to tree line and then climb the North Ridge to access the North Bowl descents. This reduces your time on the BLT road to the Herman Gulch Trailhead. There are two prominent bowls that descend the North side of Mount Sniktau. The first originates where the North Ridge descending from the summit curves to the northeast. The second bowl originates further down the North Ridge. It is possible to access the first bowl with a ski from the summit. This is most like skiing between the cornice on the right and the windswept terrain on the left. The second bowl is easily accessible from the Northeast Face route. Both routes in the bowl provide an exit to the BLT and closer to Herman Gulch than the Northeast Face exit. Be careful in the forest as the snow here may not freeze as well as the snow above tree line. Loveland Pass Trailhead is the parking lot at the top of the pass. The top of the pass is on Highway 6 and is 3.9 miles from the Loveland Ski Area on Interstate 70 and 3.7 miles from the Arapaho Basin Ski Area. Park on the east side of the road. Make sure to have your car well off the road as many cars and trucks pass through here. Herman Gulch Trailhead is located on exit 218 on Interstate 70. This is west of Bakersville and east of Loveland Pass. There is a massive parking lot on the north side of the exit with an information kiosk and outhouses. The Northeast Face and North Bowl routes end at this trailhead, and they each intersect the Bakersville-Loveland Trail that runs across the base of Mount Sniktau. This trail is accessed on the south side of the Interstate exit via Continental Divide trail markers. 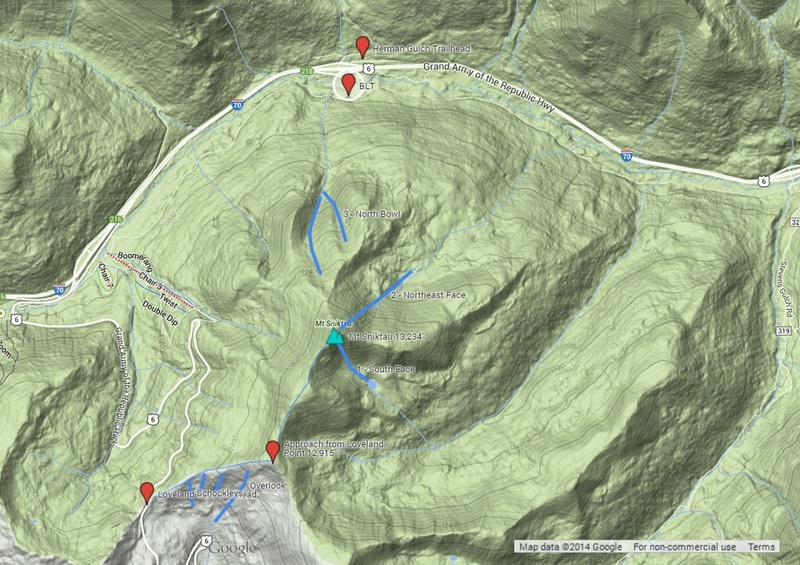 Below we have included a link to a Google interactive map and a curated list of photos of the mountain.